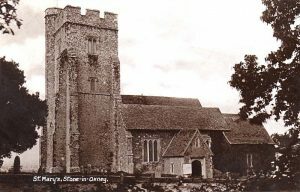 Over the years the Oxney Local History Group has gathered together a collection of historic images of Stone and a selection of these are set out below. We would like to express our appreciation to the Group for allowing their pictures to be exhibited on this website. If anyone has other pictures that they would like to offer for publication, please contact Peter Leach on peter.w.leach@btinternet.com. 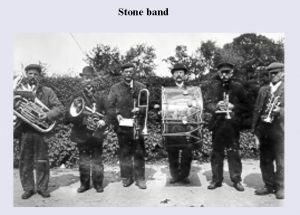 It is believed that none of these images are subject to copyright or other restrictions upon reproduction, but if anyone has any questions about this, please contact Stone Parochial Church Council. 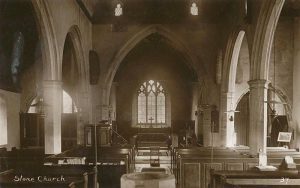 The photograph was taken from the old vicarage looking towards the south side of the church and entrance porch. 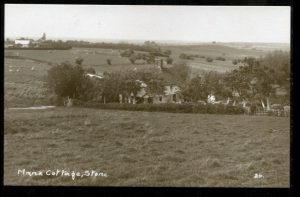 The date of this postcard is not known, possibly pre-WWI. This photo of deep winter was taken from Stepfield in the 1980s. 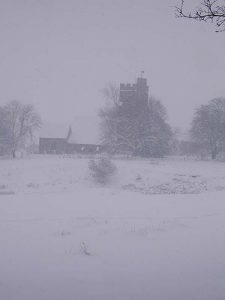 Nowadays this type of weather seems to have become a rarity. 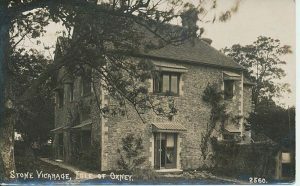 This postcard is believed to date from the 1920s or 1930s. The church was still lit by oil lamps, but is otherwise largely unchanged. 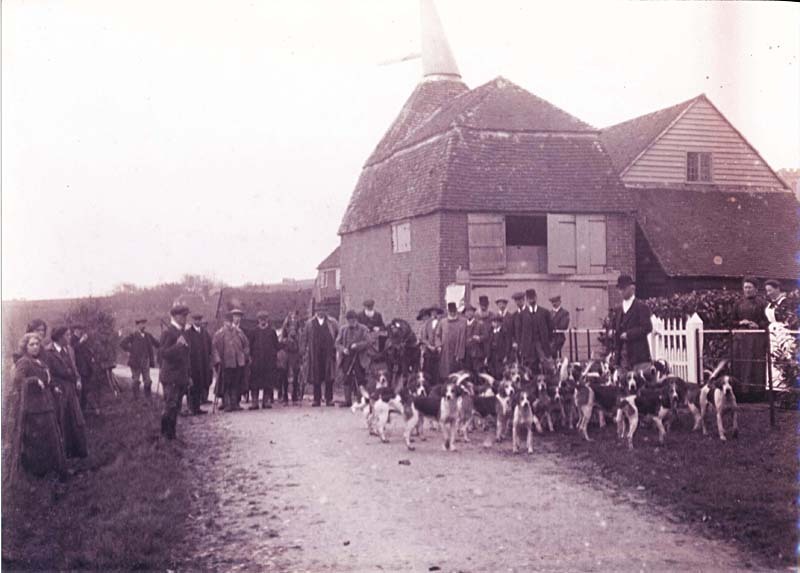 This picture was taken at Harvest Festival on 2nd October 1949 when electricity had just been installed. 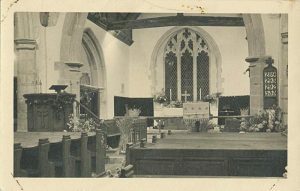 The date of this postcard is not known The Vicarage was sold off by the Diocese of Canterbury in 1969 when Stone lost its full-time vicar, a development which has been identified as the source of a subsequent decline in the importance of the Church locally. 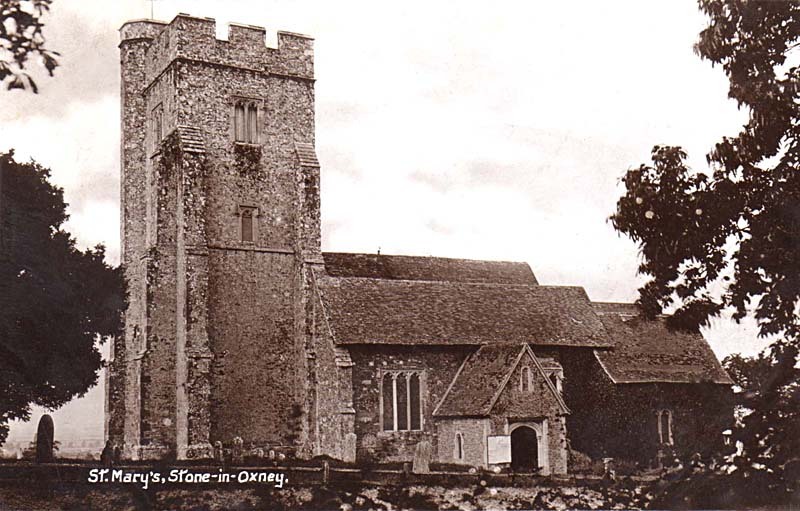 This section includes historical views of various buildings in Stone on a tour from Tilmenden to the Ferry Inn. 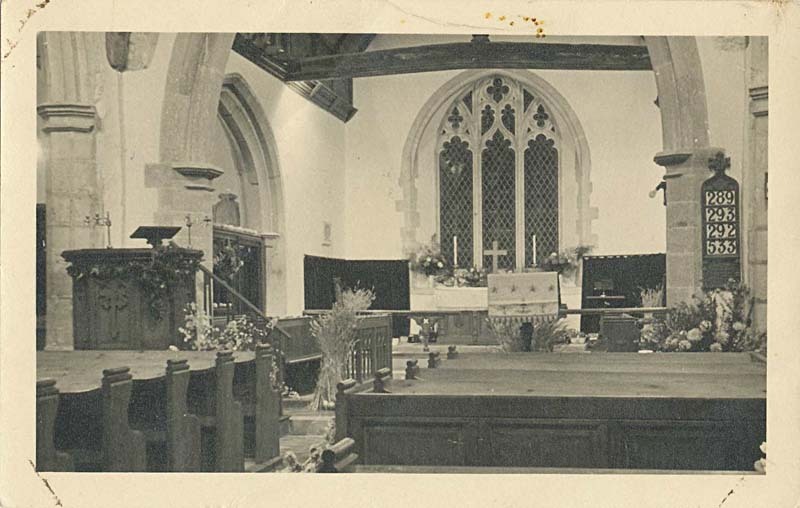 Possibly dating from the 1920s, the 1951 Garden (or Festival Bank) had not yet been created when this photo was taken. 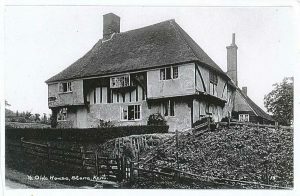 As far as is known Tilmenden is the oldest house in the village and was then known as “Ye Olde House”. In 1925 Gertrude Smith (wife of E. P. Smith) purchased the cottages which were subsequently converted into what is now The Rysings. 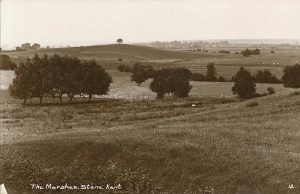 This postcard is likely to date from between 1923 and 1926 and was taken from what is now the grounds of Stepfield House. This building no longer exists. 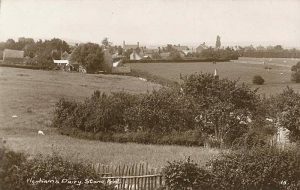 The dairy closed in the late 1940’s. 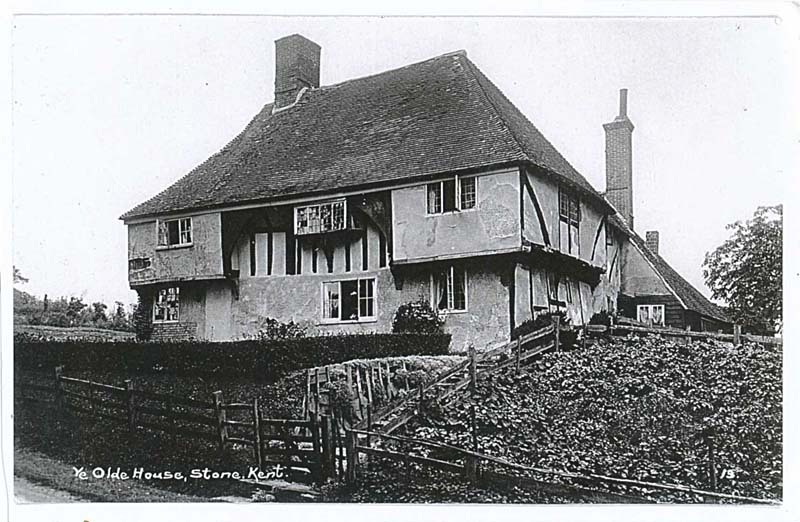 The postcard probably also dates from between 1923 and 1926 and looks towards the centre of the village. 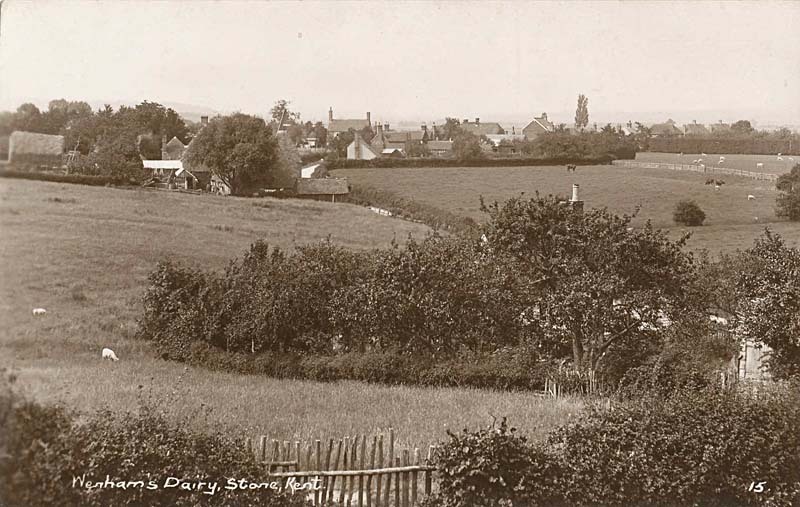 At the time this picture was taken in the late 1920s the farmhouse was relatively isolated as construction of the houses in Stone Green did not begin until 1948. 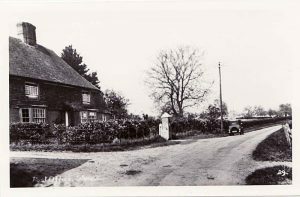 It was used as a Post Office until the late 1940s when it moved to the shop now called the Old Post House. This photograph was taken in the 1960s. 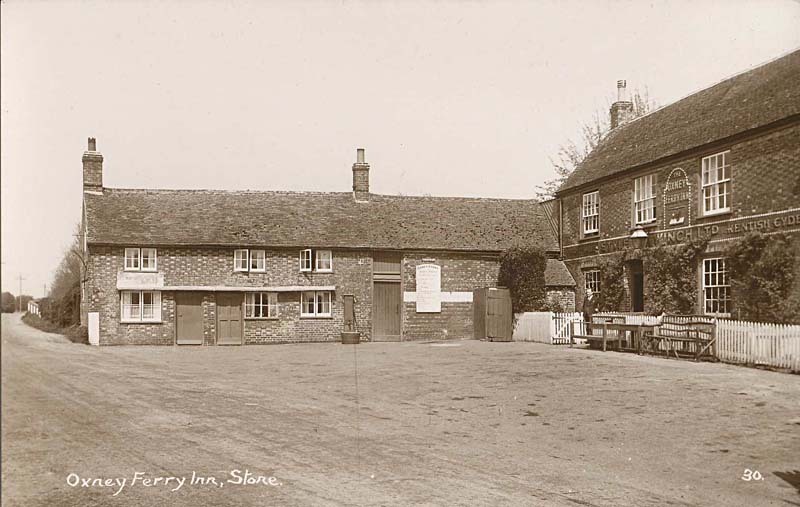 The post office operated from here until the mid-1980s when it transferred to the Crown for a short period. 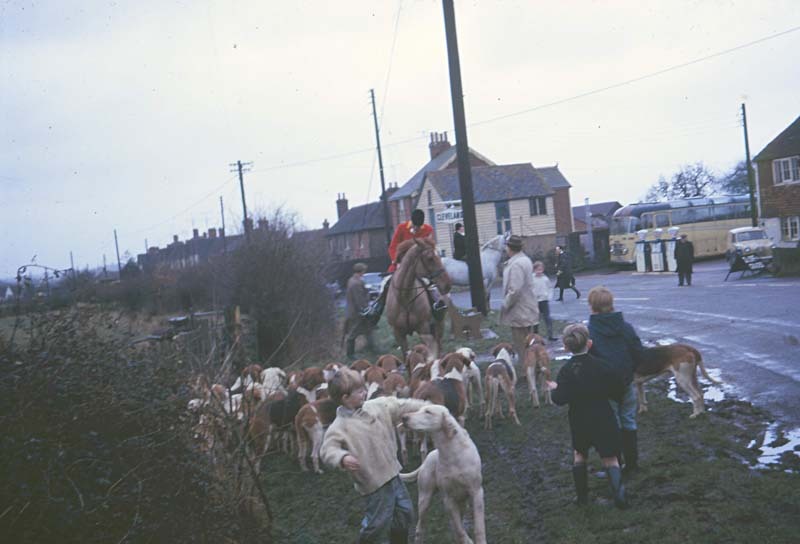 Since then the nearest post office has been at Appledore. 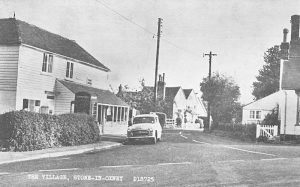 This view opposite the front of the Crown Inn dates from the early 1960s. The petrol station was established on the site of the former village joinery business. The garage opened for repairs in 1961. 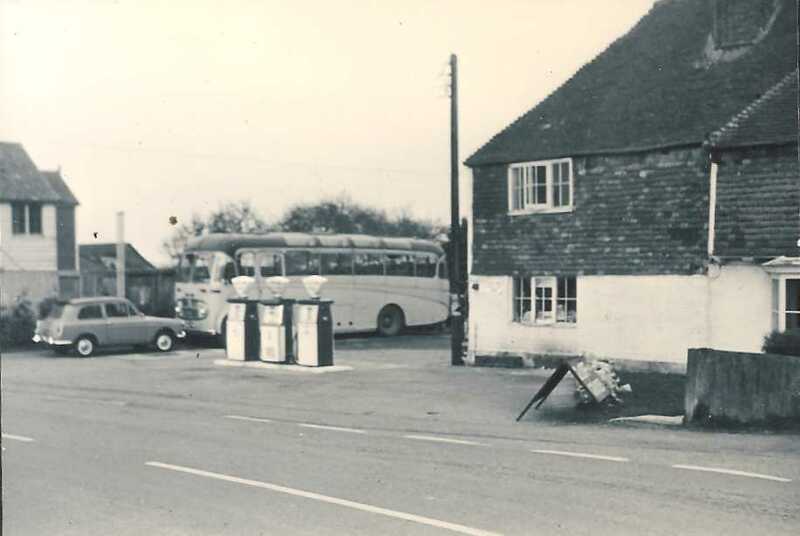 The petrol pumps were installed in 1962. The garage petrol closed in the late summer of 1977. The site is now occupied by “Lindon” and gardens. This photograph was taken at the same time as the previous one. The village sign had not yet been put up. 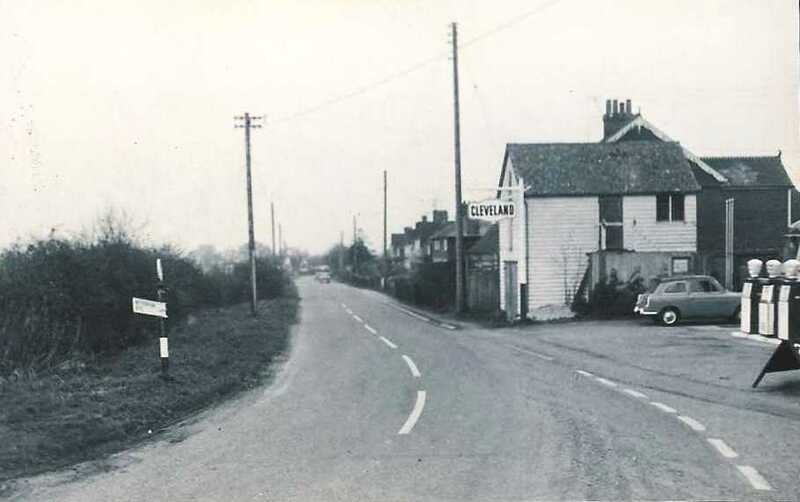 The weatherboarded building was used upstairs as a mortuary and downstairs as a motor garage. Taken in the early 1950s. Styles & Winch Ltd were a Maidstone brewery, one of the subsidiaries of Barclay, Perkins & Co. 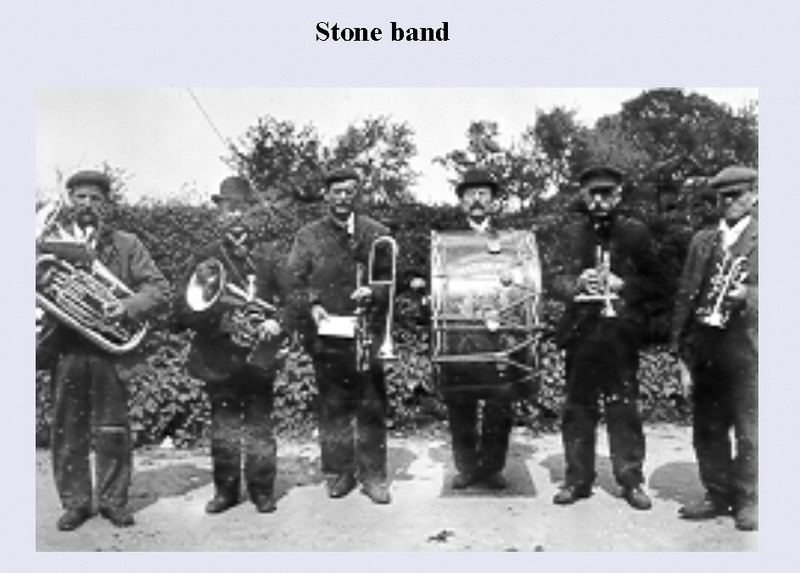 In earlier times the brewers were E Finn and Sons of Lydd. The water pump can be seen. The toll gate extended across the road parallel to the front of the cottages until 1932. Looking north. 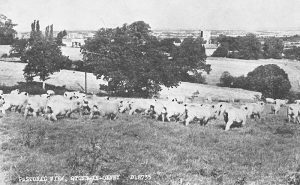 Traditionally the Marshes were grazed by sheep, but during the Second World War many fields were ploughed for the first time. The sewerage treatment plant was not built until about 1948. 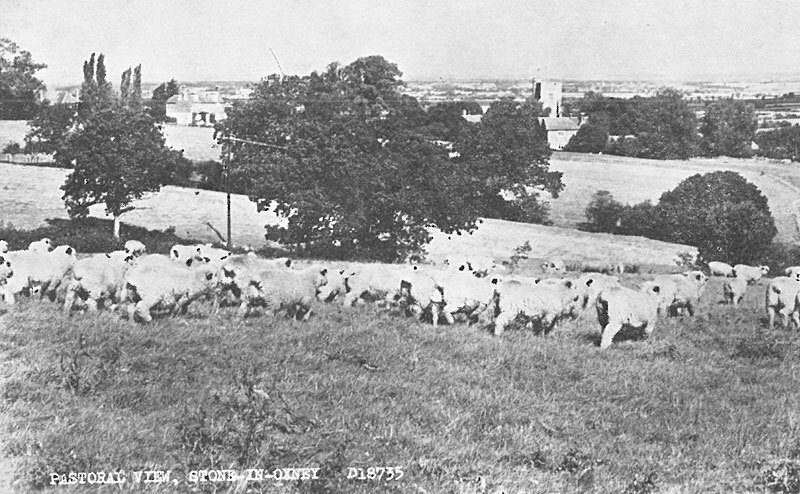 This pastoral view dates from the 1960s. 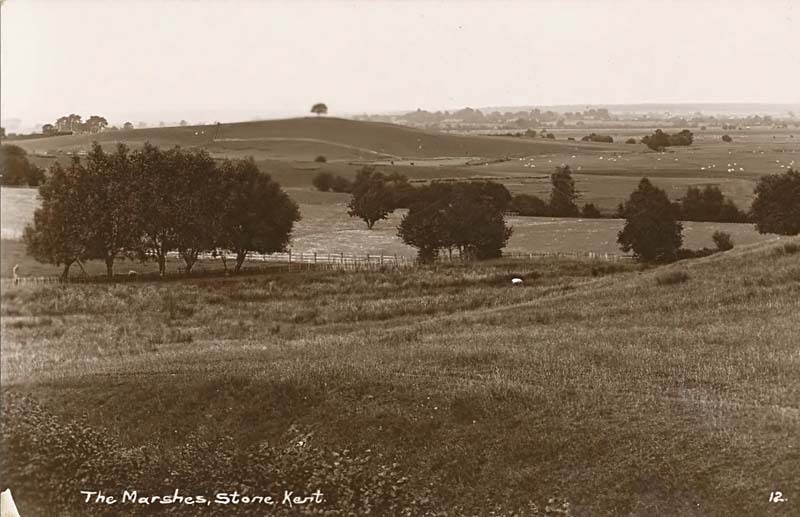 The mosaic of Romney Marsh can be seen in the distance. Taken around 1900 before the advent of radio or television, yet alone the internet! The identity of the players is unknown. 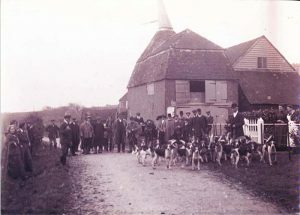 Believed to date from 1912, this photograph shows the hunt gathered at Stone Green Farm. The iron fence is still in situ. 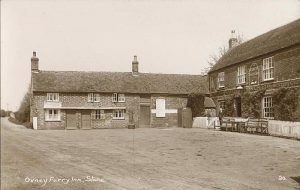 This is only a limited selection of material that is in the possession of either local residents or the Local History Group. 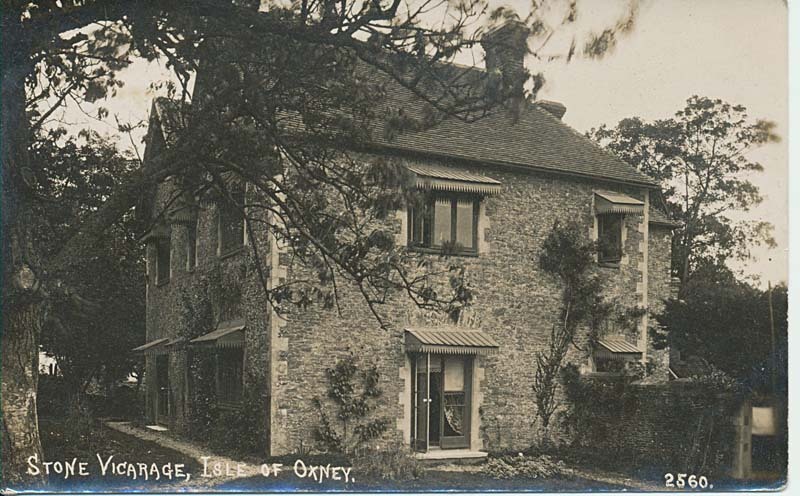 Although these images show a life that was different in many ways, Stone-in-Oxney is fortunate in that so many of its old buildings are still with us and recognisable today. Most of the sites shown above can be viewed from public roads and footpaths.